Having taken a close second in the Seimas election multi-mandate electoral district, the Lithuanian Peasant and Greens Union (LVŽS) has not lost hope in winning against the Homeland Union – Lithuanian Christian democrats (TS-LKD) in the second round and obtain an advantage in coalition negotiations. While the current success of the LVŽS is based in a timely use of a so-called group of professionals, a closer look reveals that the party has a number of other trump cards to play, Alfa.lt reported. The context of this year’s Seimas election can make it difficult to remember that the LVŽS is not a new political entity. The “Peasants” entered the Lithuanian political arena right after the re-establishment of independence, albeit for more than a decade, the party lacked any major successes and had to make do with only a handful of Seimas mandates, won in single-mandate electoral districts. Initially it wasn’t made better by the young farmer and fertiliser retailer from Šiauliai region Ramūnas Karbauskis become party Chairman in 1998. The first serious attempt at taking power went through a typical scenario, often seen in Lithuanian politics – a political marriage with another not so successful political power. In 2001 they joined with Kazimiera Danutė Prunskienė‘s New Democracy Party, leaving the new entity’s chairmanship to her. In 2004 the Peasant and New Democracy Union (VNDS) entered Seimas based on the proportional system, but already in 2008 the “Peasant” project started fracturing again. Having renamed themselves to the Lithuanian Peasant Popular Union (LVLS), they failed to enter Seimas and in 2009 lost K. Prunskienė who went her own way. Having retaken chairmanship, Karbauskis would need almost two electoral cycles to recreate the “Peasants”. Already in 2009 the Naisių Vasara projects were begun, which helped create the party leader’s non-political image and broadcast a message directed at the rural audience. 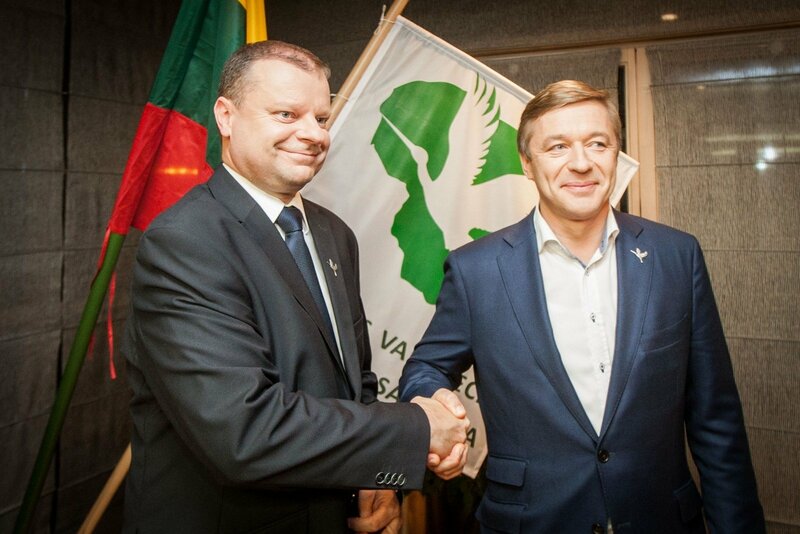 Another important element was absorbed in 2012, when the LVLS renamed itself to the Lithuanian Peasant and Greens Union (LVŽS). This was a step, which the Lithuanian Green Party (founded in 2011) leader Linas Balsys would come to complain about during this year‘s campaigning period, pointing out that aparently Karbauskis personally told him that the “Green” label was only used to attract the attention of urban voters. Finally for the 2016 elections, Karbauskis would begin forming his so-called expert team. 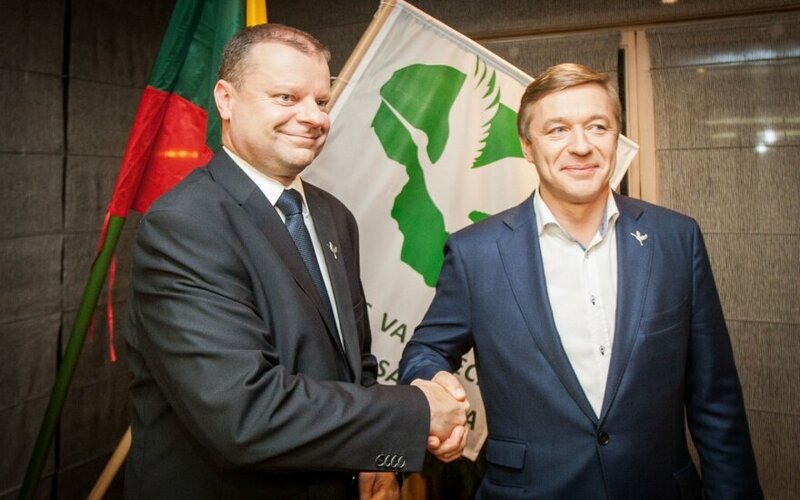 The first position on the electoral roll was given to the popular former police Chief Commissioner and Minister of the Interior Saulius Skvernelis, while other former law enforecement officers, known academics, doctors, healthy lifestyle advocates, a known financial analyst and human rights activist were also brought on board. The first ten members of the LVŽS electoral roll contain 5 non-partisan participants, an attempt to attract voters with promises of non-politicised politics with no precedent. It is hard to deny, that the party electoral roll obtained significant contributions from the presence of professionals such as Skvernelis (115770 priority votes), one of the most well-known proponents of abstinence in Lithuania, psychiatrist Aurelijus Veryga (33620 votes), former Special Investigation Service (STT) Panėvežys branch head Povilas Urbšys (32350 votes), Lithuanian Science Academy (LMA) member and Lithuanian Educology Universty (LEU) History Faculty dean prof. Eugenijus Jovaiša (31908 votes), former advisor to PM Algirdas Butkevičius, who resoundingly resigned in 2014, Stasys Jakeliūnas (19331 votes) and even the former Lithuanian Human Rights Monitoring Institute (LŽTSI) head Dovilė Šakalienė (5757 votes). The wave of professionals was so large and strong that there were some curious cases where a little known student Rūta Miliūtė jumped from 114 to 28th place in the “Peasant” electoral roll, almost guaranteeing a place in Seimas. It cannot be denied that at least a part of the 3576 voters who gave their priority votes to the 25 year old Milūtė could have simply confused her with the famous television journalist Rita Miliūtė. The student’s achievement was finally overshadowed by the repentance of Conservative defector Egidijus Vareikis, who jumped from the last, 141st position in the “Peasant” list to 23rd thanks to 4222 voters, which almost guarantees a place in Seimas. Whatever the motivation of “Peasant” voters, without help from the side R. Karbauskis’ party core would have hardly managed to take second place in the multi-mandate electoral district. Veteran member of Seimas Rima Baūkienė (41604 priority votes), infamous for scandalous statements (“There are traces of monkey, even female abortions, there’s everything in inoculations”) healthy lifestyle advocate Dainius Kepenis (23082 votes), Chamber of Agriculture Chairman Bronius Markauskas (6259 votes) do not have such political weight that they could turn from political dwarves into giants by their own power overnight. Just professionals and party veterans may not be enough for the LVŽS to triumph in the second round of elections. In it, an impressive number of political veterans and defectors from other parties will also join the battle, having achieved notable performances in the first round battle. An undisputed leader among such defectors is Valerijus Simulikas. In the Šiauliai Saulė district he is leading by 9% against Social Democrat Arvydas Mockus, formerly his own party member. Simulikas was with the LSDP from 2011 to 2014, while also being in the ranks of the New Union from 1999 to 2011. From 2014, the politician, having 4 terms under his belt, was among the ranks of the social movement For Šiauliai which is when he gained an opportunity to join the LVŽS’ political wave. Another defector from the LSDP is the current LVŽS candidate in the Kaišiadorys-Elektrėnai district Laimutė Matkevičienė. In 2015 the then Elektrėnai hospital director participated in the municipal elections with the Social Democrats. A year on and we find her as a non-partisan member of the LVŽS electoral roll (despite a fairly low 76th place, helped very little by priority votes) and lauded by local news media in Kaišiadorys region as “an incredibly sensitive, bright, intelligent and empathic <…> local.” Her chances of defeating Conservative rival Mantas Adomėnas are fairly good. The LVŽS candidate in the Šilutė district Alfredas Stasys Nausėda also cannot be completely calm whether he will enter Seimas through the listing (30th after priority votes, up from 65th). However the long term Lithuanian Democratic Labour Party (LDDP, from 1990) and LSDP (from 2001) member, it appears, is quite familiar with how one should seek authority, he is leading against Conservative Sandra Tamašauskienė by 7% (26% versus 19%). An interesting fact is that in his biography Nausėda does not even mention having ever left the LSDP. Just back in 2015, he was running for mayor in Šilutė as a Social Democrat candidate. The former Lithuanian Centre Party (LCP) member and deputy chairman Arūnas Gumuliauskas will find the battle in the Semigalia district to be tough. He is 19% behind Liberal Movement representative Vitalijus Gailius. Most likely to enter Seimas are to defectors from the TS-LKD: Robertas Šarknickas, who left the Conservatives just in spring (currently in a confident lead against Social Democrat Julius Sabatauskas in Alytus) and formerly a Conservative member of the Skuodas municipal council Levutė Staniuvienė, who is slightly trailing behind formerly fellow party member Gediminas Anužis. All these candidates have only recently joined the LVŽS camp and as results show, have strengthened the “Peasant” chances in at least six districts. Such a victory would conclude Karbauskis’ party transformation and would most likely grant the initiative in forming a new coalition government. However as noted by Vilnius University political scientist, electoral system analyst Mažvydas Jastramskis on Tuesday, looking at the LVŽS camp there rises a question of party and future fraction heterogeneity. Aparently “inevitably there should be considerations of the potential for members to “detach” even in the first half of term.” This would mean that the potential LVŽS and TS-LKD coalition could be particularly fragile specifically because of the LVŽS’ fortune having been “glued” together last minute out of specialists and political veterans.